Are you ready to start making texture in your crochet work? If so, then lets get stared with the basics! 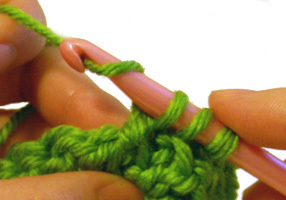 Front post double crochet is also known as front raised double crochet. 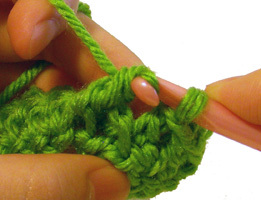 Front post can be done using many stitches, but for this tutorial we will focus on the popular double crochet stitch. 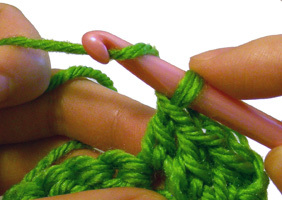 You will need to know the basics of crocheting before attempting this tutorial. 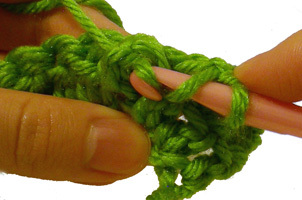 Visit the Crochet Tutorials Section for more help. 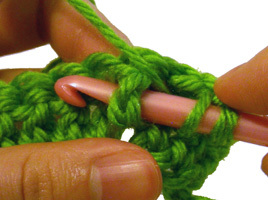 The only thing that is different in a front post double crochet compared to a regular double crochet is the location you insert your hook to make your stitch. Visit the Crochet Tutorials Section for more fun tutorials! This entry was posted on Thursday, July 30th, 2009 at 5:16 AM by Rachel Choi	and is filed under Tutorials and Help. You can follow any responses to this entry through the RSS 2.0 feed. You can leave a response, or trackback from your own site. Which stitch do you form this stitch around – is it the one you just made or one in the previous row? Or would the pattern say? Got to say, love your photographs, so well focused and framed compared with some sites, or even published books! You normally make it around a stitch on the previous row. But if you’re working with a pattern, it should tell you where to make it. I was hoping for a bit of advice, it’s not on one of your patterns but I’m hoping you might be able to help me anyway. I’m doing the Moss Stitch Afghan from the Lion Brand website and I’ve been stumped by one of the lines. I was thinking that they mean alternating between front and back post sc, but I’m not sure and was wondering what you thought. Thanks. Hi Bookworm, my guess is as good as yours. I’d recommend sending an email to the Lion Brand folks. They would know more about the pattern than me. …I didn’t even know I could do that 😀 I’ll go do that now. Thanks for the suggestion. I emailed them and got a response, now I’m on my way. Turns out it was what I thought. Dear Rachel, I am so happy to receive your emails. You bring up topics and give suggestions, that leave me smacking my head with “a why didn’t think of that” mode. I was also happy to learn from the Making clothes warmer segment. 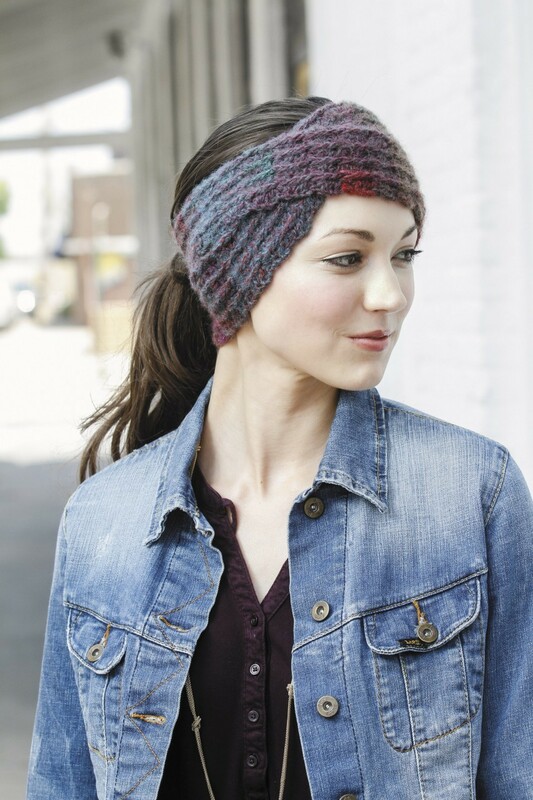 I didn’t realize FPDC and BPDC would result in a warmer beanie. Although I live in Arizona, I do crochet gifts for family in Wisconsin and they want WARM stuff. Also the Kiss Me Bag looks great. I am using a cane for a while and long handled purses or bags flop all around. As soon as I am done trying to get a slouch or beret done (wish me luck on that), I really want that bag. My Christmas present to myself. Again thank you so much for all the sharing that you do. am trying to figure out how to do this step . . . “working BEHIND FPtr just made work FPtr around each skipped st”. Those skipped stitches are double crochet stitches. You have the chain, then one row of dc, then start with FPdc and FPtr, etc. Working behind has me baffled on how to maneuver the hook to make that stitch. Thanks. Hi Karen, I think it’s trying to tell you to put your hook behind (instead of in front of) the fptr that you already made in order to get to the stitch you skipped. So try and make a fptr in the skipped stitch. In doing so, you’re going to have to either but your hook in front or behind the fptr that you already made. When you make the new fptr it will overlap the existing fptr. Thank-you so much for the left-handed option! I’ve never seen this before. It was so nice not to wrap my brain around mirror images. Would love if someone could post wonderful pictures and instructions on how to front post double crochet decrease. I have a pattern that I need to do that and the book’s instructions aren’t super clear. I know how to double crochet decrease so I’m assuming its similar but would love clarification. Yes, it is the same idea as the regular double crochet decrease. The only different is that when you insert your hook into the stitches on the previous row you’ll insert it as if you’re working around the post of the stitch like when you’re making a fpdc. Hi Linda, it seems like the pattern wants you to make 1 fpdc around each of the next 4 dc. So you’ll make 4 fpdc lik this tutorial shows. Hi Maria, I’m not sure what the “slipped hdc” is referring to. Is there a row of hdc worked before somewhere? Maybe it’s a typo and it meant is say “skipped” instead of “slipped”? I’d recommend contacting the designer of the pattern if possible, since he/she would be able to clarify. This was really helpful, and completely clarified what my pattern had only half explained. Thank you! I just wanted to say that I love your site because of the left-handed pictures! Very helpful!! Thanks! My question is regarding the next stitch. If the pattern called for a dc next, does it go in the stitch immediately next to the post or does it go into the next one over? Thanks! Hi Suzanne, if you worked fpdc around a stitch, then you would skip the stitch that you just worked around and work into the next stitch to make your next double crochet. fpdc…vs bpdc……on bpdc….does the hook end up in back of post before the second yarn over…. and the foundation row is always dc. row, right……and in foundation row, is it dc chain one, dc chain one? For the foundation row, it really depends on the pattern. It can almost be any combination of stitches on the foundation row, depending on what you want it to look like. I am entirely new to the front (back) post stitches. After I have done a row of either, where do I place the hook for a row of regular stitches? 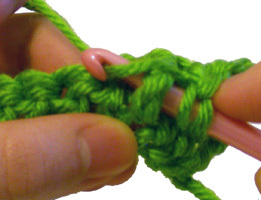 Look in the “crossed cable” section where it shows working in the skipped stitch. Working in front of the stitches just made is what is shown in the example. I am working a pattern that says work FPDC around DC in row below the next DC, DC in next DC. The word below is bold. Does this mean to work in the row I just finished or to go another row below that even? For instance, I crocheted one row, then a second row, now on my third row and those are the instructions. Do I crochet in the first or second row when it says below? Help! Hi Monica, the “dc in row below the next dc” would refer not to the next dc, but the dc underneath the next dc. So instead of working in the next row down ( the next dc), you’ll work in the row below that. Thank you SO much, Rachel! All the videos I watched on FPdc were working just one row below. Now that I’m working TWO rows below, I’m seeing the “raised braided” looking vertical row take shape. It’s starting to look like the picture, finally! Again, thank you so much for your help! Greatly appreciated! I am fairly new to crocheting and I am working a chevron relief stitch. The pattern says to (work FPdc around post of st below next sc) I THINK I have this figured out, but then it says to skip 2 sc behind FPdc. (now and throughout) what does skip sc BEHIND FPdc mean? very confused. From what you described it sounds like are you working backward? So you are going back 2 sc before the fpdc stitch. I’m not 100% sure, I would probably need more context to figure it out. If this is a Crochet Spot pattern, let me know the link and I’ll take a closer look at it. You can also try asking the designer of the pattern since he/she will be the best help. I would probably have to see the pattern in order to understand the instructions. If it is a Crochet Spot pattern, let me know the link and I can take a closer look at it. You can also ask the designer of the pattern for help since he/she would be the best person to answer your question. I stumbled across this stitch and couldn’t find it in the Vogue Crochet Dictionary. Thanks for the step-by-step instructions and the awesome photos. I’ve just done an fptr in a previous row but the pattern tells me to skip 3 stitches behind fptr and I have no idea what this means – could you help? Sounds like you are working backwards on your row. So you should count back 3 stitches from where you made your fptr. I am trying to understand how to do a FPDC around a half double crochet. It says to insert hook into front and come out the front and then go into the back and out the front, so I am right back where I started from. Can you help me understand how to do this stitch? Thanks for any help. Try following the steps in this tutorial. Even if you are working around a hdc, the steps in this tutorial are the same to create the fpdc. You are so awesome to post left-handed instructions! Do all your tutorials have the mouse-over? I have other left handed friends who want to learn/learn more about crochet, and the visuals you provide are priceless! Hi Sylvia! 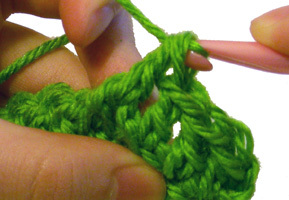 Most of the stitch tutorials have left handed views. Feel free to share with your friends! I’ve looked over these examples and at the cable stitch tutorial, and the wording I’m working with is a little different: Row 1(RS) – Cable Twist: 1 BPdc, skip next 4 dc, work FPtr on next 4 dc, working in back of sts just made, work FPdc over 4 skipped dc – Cable Twist made, 1 BPdc. This part is what I don’t understand: “working in back of sts just made, work FPdc over 4 skipped dc”. Only one FPdc? Over how many what? Are you able to decipher this? I’m going crosseyed. Hi Courtney! When it says “fpdc over 4 skipped dc” I think it means 1 fpdc in each of the 4 stitches that you skipped, so you’ll have 4 fpdc total. When you work into the skipped stitches, you can either cross your hook in front of your work or behind your work to make the new stitches. So the “working in back of sts just made” means to cross the hook onto the back side of your work (the stitches just made) in order to make the fpdc’s. This makes the 4 fptr you made at the beginning appear on top of the 4 fpdc that you are working into the skipped stitches. I am a left handed crocheted. I am making a,bowler and it call for fpdc in the round. However since I am working on the wrong side shouldnt I do bpdc instead so the raised part would be on the front? Hi Linda! Even though you are left handed the right and wrong side are usually the same as right handers. The only difference is the direction you are working in, left to right instead of right to left. I would think you would still work the fpdc. But if you ended up on the wrong side for some reason, then you can go ahead and switch it to bpdc. I am making a bolero. I really appreciate your site. It is one of the most useful sites out there….thanks. I need some help with the sun hat pattern I am working . I understand how to make fpdc’s, but the next stitch in the pattern is a dc and I am not sure where to put it. The pattern is to alternate fpdc and dc. Can you please help. Hello! 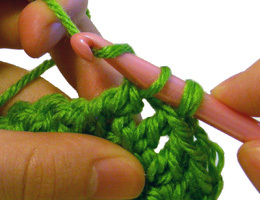 If it doesn’t specify, you will make the double crochet by inserting your hook under the front and back loops like you normally would. I’m doing a basket weave men’s hat and pattern says “do beginning to dc. I know how to do afpdc but how do you do a beginning ( of row)fpdc? Pretend there is an invisible double crochet on the other side of it. The motion of your hook will be the same, whether it is being working around the first dc or a dc in the middle of the row.